Today, the health and beauty team at Vibe MedSpa will share with you five more reasons to consider this groundbreaking therapy as an effective solution for your skin concerns. Ready to arrange a consultation? Call the Top Rated Local® med spa in Scottsdale, AZ, to make an appointment. IPL photofacial therapy is an ideal treatment for those who suffer from acne. This is because the lasers effectively treat and relieve inflammation and redness caused by acne. Plus, the lasers can shrink large pores that allow dirt and bacteria into your skin, which contributes to acne and acne breakouts. This laser treatment reduces the need to apply topical acne treatments, leaving you with softer, evenly toned skin. Having large pores allows for more dirt, oil, and makeup to collect, which contributes to acne, breakouts, and other skin irritations. An IPL photofacial with our medical spa in Scottsdale can reduce the appearance of large pores. By effectively reducing their size using the IPL system, makeup applications will look smoother and your skin will look and feel cleaner. Skin Redness Doesn’t Stand a Chance! An IPL photofacial decreases the visibility of redness and blotchy spots caused by acne, rosacea, and other conditions. A photofacial uses high-intensity lights that penetrate every layer of our skin to gently erase imperfections that cause redness. IPL photofacial treatments can be completed in about 30 minutes. This treatment can be completed over your lunch break! Most people notice immediate results after just one treatment. Keep in mind that every patient is different, so results may vary. Another excellent perk about photofacials, is that they are an ideal skin care solution for both men and women. Along with the quickness of the procedure, there is no downtime following the treatment. You can come in for your appointment and get right back to your day once your appointment is over. 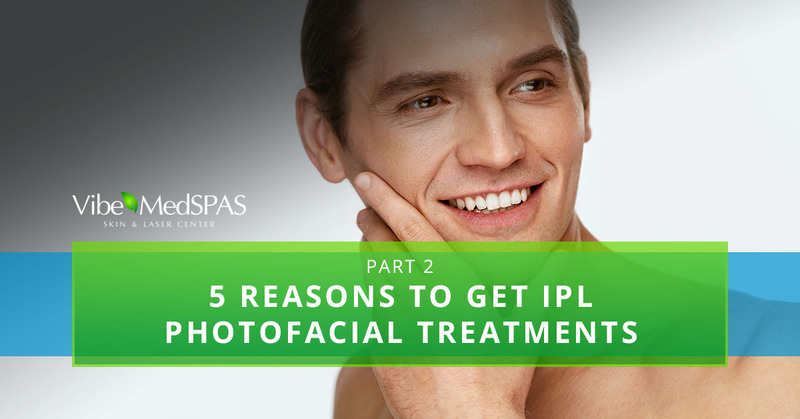 IPL photofacial treatments offer a myriad of benefits for a wide range of skin issues. If you’re ready to experience the benefits of this innovative treatment, reach out to our medical spa in Scottsdale, Arizona, and get the results you desire! Contact Vibe MedSpas today to get started.